In a couple of weeks the crops will start to come up and the fields will turn a lush green color. This beautiful old barn features vertical wood siding and a stone or concrete wall foundation. Vertical siding was used in barn construction prior to the overlapping wooden siding that was available later. The vertical siding meant less trapping of moisture in the seems than horizontal non overlapped siding would allow, so was the preferred method for wood barns until overlapping siding became widely available. 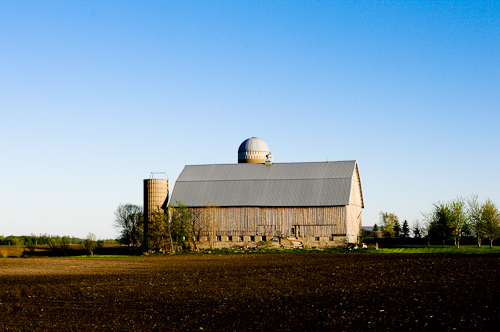 This entry was posted in Uncategorized and tagged afternoon sun, barn, blue sky, copyright ryan ware, farm, farm site, field, fleeting farm, rural, silo, veritcal siding, wood barn. Bookmark the permalink.